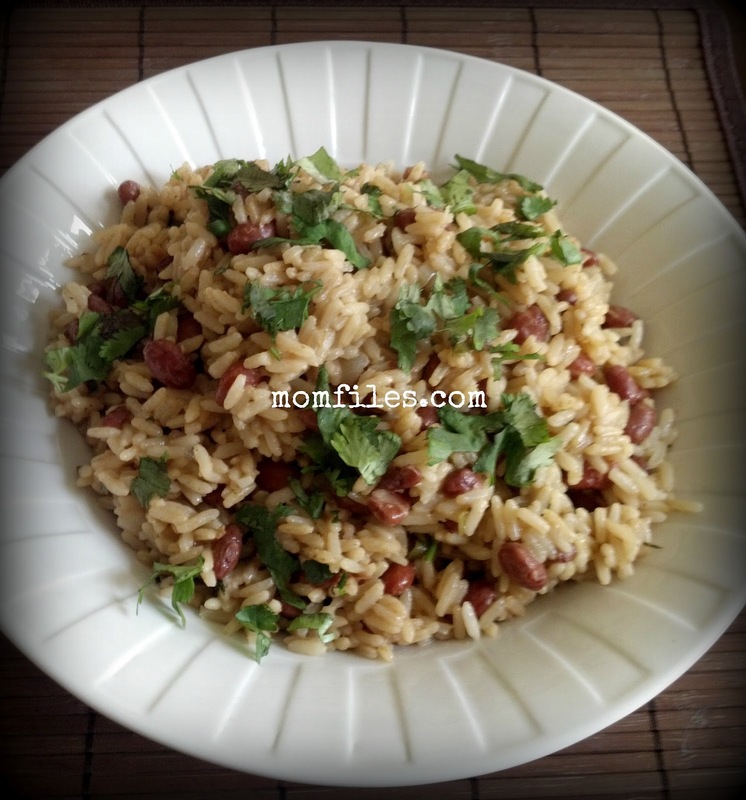 Today I am sharing a recipe with you all that is a very common Guyanese main/side dish called "cook-up" rice. I think it is one of those meals that you almost always have the ingredients on hand to make and it is very versatile. In all the different West Indian countries this dish is called by different names like rice & peas, peas & rice or pilau. I have always known it to be called cook-up rice and it can be made with any type of rice or beans/legumes. 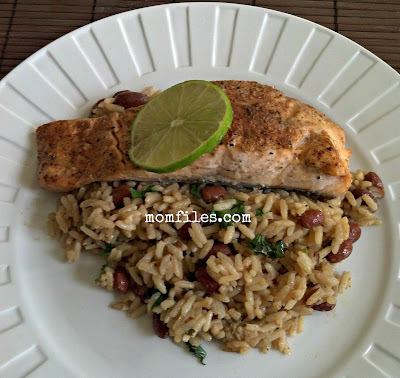 Typically you would use pigeon peas, black eyed peas or red beans. One of the main ingredients that makes this rice dish so special is the use of coconut milk, herbs and spices. Everyone makes their own version and today I will share mine. Please be aware that my recipes are seldom done in precise measurements so I did my best to estimate to make it easier for you. -hot pepper (optional) You can use scotch bonnet, habanero or wiri wiri pepper but leave it whole. Note: you can cook this dish with meat but I prefer it as a side dish. I melt the butter and saute the onion for a couple minutes. I then add the garlic and hot pepper (leave it whole). 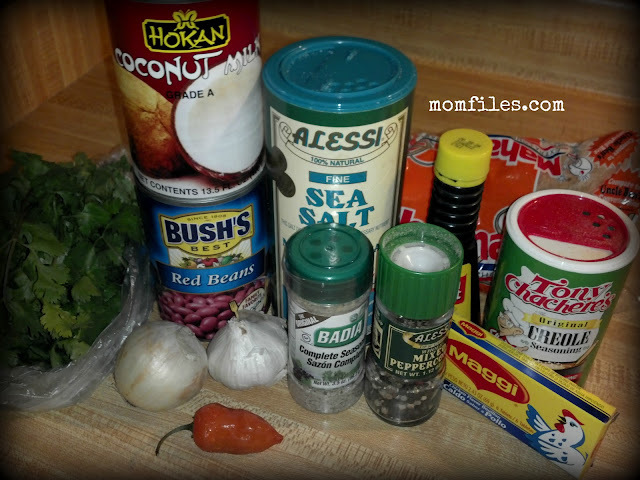 Next, I add the can of coconut milk, can of beans, some dried thyme, the bullion cube and the remaining seasoning except the salt. I bring all of that to a boil to dissolve the bullion cube and then add the rice and browning sauce and some water. I then taste for salt and add if needed. At this point (if desired) you can press the whole hot pepper with your cooking spoon to release some heat and flavor. Turn it down to medium/low heat and make sure you have enough water in there for the rice to cook properly. It can take about 20-30 minutes cooking time. Once all the liquid is absorbed, I add some fresh chopped cilantro and toss it around. That's it! I served it with some wonderful broiled salmon and it was a big hit with the family. You can also serve it with chicken, steak or pork chops. If you want to keep it meat free then you can add salad or roasted veggies on the side. The only thing this meal was missing was some fried plantains. I couldn't find any ripe ones in the store. Sounds delicious and like something my kids would love. This sounds delicious and I'm so going to try it while I'm here in 'Merica with easy access to the ingredients! Thanks for sharing. I've never had coconut milk before but that rice sure does look good. That's something I could probably even eat right now on my soft food diet. This looks delicious! I've never cooked with coconut milk, but can't wait to try it. I have to tet this! !! Found it!! Definitely gonna try this. Yum, I make with pan browned chicken in the rice as a main dish and a side of fried plantains. I lived in Guyana for a year. As a picky eater, I pretty much lived on cookup and roti. I've missed it and tried several recipes I've found. None of them tasted like the cookup I remembered. Today I tried my recipe and it was exactly what I remembered! I gave some to my two year old and he said "mmm good!" He's not a big talker and that was the first time he's ever added good to mmm. I consider it a glowing endorsement. Thanks for bringing back the taste I had missed! !